(Bloomberg) -- Geoff Dennis has had it with the pessimists who point to selloffs in Argentina, Turkey and now Brazil as evidence that bears have the upper hand in the developing world. "This talk about a crisis in emerging markets is just nonsense," Dennis, head of global emerging-market strategy at UBS, said on Bloomberg TV. He’s not alone. Analysts at firms ranging from PGIM Inc. to HSBC Securities say the recent weakness is the exception, not the rule, and that in fact emerging-market assets look pretty attractive now. 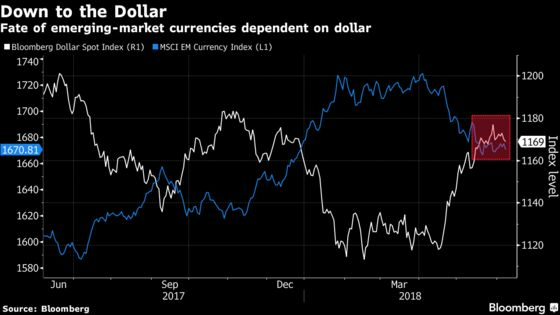 They say the U.S. dollar rally that started in mid-April will soon run out of steam, while earnings growth, cheaper valuations and widening growth differentials with developed peers will support equities. It’s all a starkly different tone from Mohamed El-Erian’s warning about playing whack-a-mole with financial crises. "If one animal gets sick in the zoo that doesn’t mean there will be contagion risk," said Anastasia Levashova, a London-based fund manager at Blackfriars Asset Management. "EM is not in crisis and there is no contagion." Even some trouble spots are presenting buying opportunities. 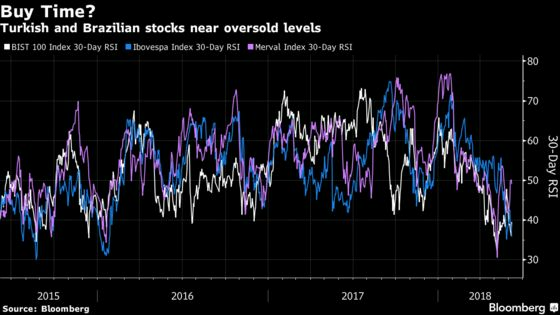 Levashova said she favors stocks from Turkey, Russia and Greece, while Dennis upgraded to overweight equities in Mexico and Europe, the Middle East and Africa. "These ‘weak links’ don’t operate in a vacuum -- when they sell off, there is a policy response," said Cathy Hepworth, managing director for emerging-market fixed income at PGIM Inc. "In the case of Argentina, we saw the rate hikes, the BCRA moves, the IMF engagement, and even in Turkey, we saw rate hikes." "We may not think the policy response is adequate in some instances, and there may be political feedback, but nonetheless, the situations are fluid." "This is your opportunity for emerging markets," Ben Laidler, a global equity strategist at HSBC Securities, said on Bloomberg TV. "It’s still the fastest-growing asset class in the world in equities, it’s the cheapest and it’s the biggest underweight." "While the weakest members of the herd are being picked off, it’s also true that the terrain has simply gotten a lot rougher," said Sonja Gibbs, a senior director at the Institute of International Finance in Washington. "That exposes vulnerabilities, encouraging the coyotes to attack."